Creative wedding lighting can really add a touch of class and magic to your nuptials, and ensure an unforgettable night for both the newlyweds and the guests alike. Here are the latest and greatest wedding lighting trends that are taking the world by storm. Our range of chandeliers was developed to reflect world trends and the most popular and beautiful styles. They are classic and are perfect for all wedding themes; from vintage chic to pure luxury. Chandeliers come in a range of styles can be mixed and matched, can be hung in clusters or can be customised with stunning floral displays. The perfect chandelier feature can completely transform your wedding venue from ordinary to enchanting! How beautiful would it be to stage your wedding under the twinkling stars of the night sky? If that sounds like something that appeals to you, it might be worthwhile considering fairy lights for your wedding. Fairy lights are a great way of transforming a venue space into something truly spectacular, and can really enhance the romanticism and magic of the room. The lights themselves come in a wonderful warm white colour, and can be customised with either white strings for traditional weddings or sleek black strings to suit the needs of your venue. What better way to celebrate the joining of two hearts than with a personalised monogram projection? This eye-catching feature is certain to be the first thing that your guests notice when they enter the room and will definitely leave an impression that won’t soon be forgotten. The monogram in question can be tailored to a style that suits you, and there are several different variations available to suit any budget. While fairy lights and personalised monograms are more modern wedding innovations, hanging festoon and bulb lights are an old classic that has been brought back to life for the 21st century. These lights are excellent for creating a more expansive atmosphere in a space and adding a real timeless charm to your wedding. The great thing about these string lights is that they can come in clear, frosted and coloured variations and can also be dimmed on the night to suit the mood of the moment – magical! 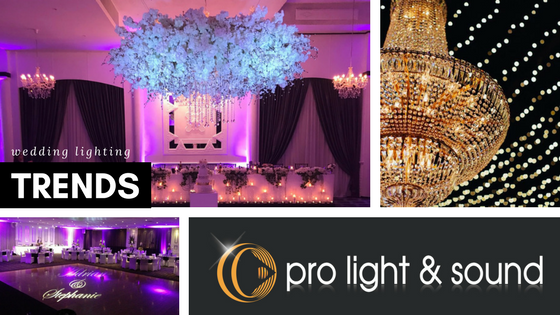 Once you have made a decision on the venue for your wedding, make sure you talk to the experts at Pro Light & Sound. With years of experience in lighting equipment and wedding planning, they have the tools you need to make your special day unforgettable.